Maxi-Cash outlet in Singapore’s Little India neighborhood; taken in October 2018. 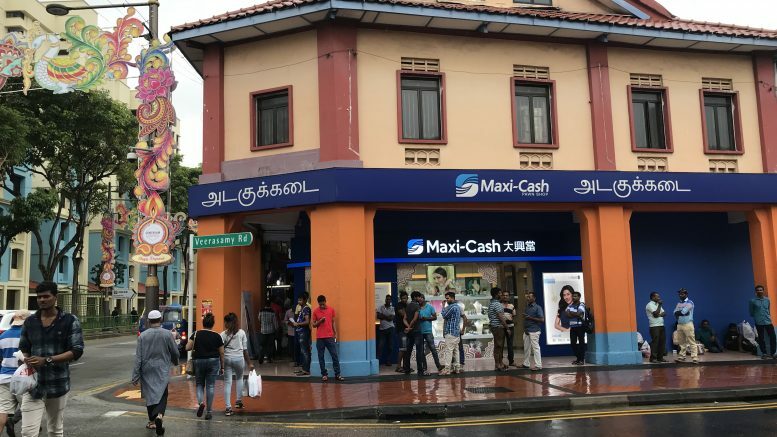 Pawnbroker Maxi-Cash reported on Wednesday its third-quarter net profit fell 36 percent on-year to S$2.74 million amid higher expenses. Revenue for the quarter ended 30 September rose 12 percent on-year to S$51.1 million, it said in a filing to SGX after the market close on Wednesday. “The increase in revenue was primarily attributed to higher interest income from the pawnbroking business, higher sales from the retail and trading of jewellery and branded merchandise business and contribution from the secured lending business,” Maxi-Cash said. Material costs for the quarter rose 8 percent on-year to S$33.50 million, employee benefit costs increased 14 percent on-year to S$4.85 million, finance costs rose 41 percent on-year to S$2.89 million and other operating expenses were up 59 percent on-year at S$7.73 million, it said. “The increase in material costs was generally in line with the increase in revenue from the retail and trading of jewellery and branded merchandise business. The increase in staff costs, rental and depreciation costs was mainly due to the increase in the number of shops. The increase in finance cost was largely due to higher interest-bearing loan and the issuance of multicurrency medium notes,” the pawnbroker said. For the nine-month period, net profit fell 15 percent on-year to S$8.05 million, while revenue rose 14 percent on-year to S$158.47 million, it said. Higher interest income from a growing pledge book boosted revenue in the nine-month period, Maxi-Cash said, adding the retail and trading of jewellery and branded merchandise business reported a 10.6 percent on-year increase in revenue in the nine-month period, while the secured lending business reported a revenue of S$6.3 million. The company’s outlook was cautious.